Last month, we shared our POLICY PERSPECTIVE on the SC Energy Freedom Act noting the hallmarks of good public policy that the compromise version of this bill contains: principals of transparency and open public discourse. The bill also contains provisions that acknowledge the increasing role of diverse voices and perspectives in the energy marketplace by affirmatively including them during Commission proceedings. We simply couldn’t agree more that stable policies and limited government restriction are critical to the growth of our state’s clean energy economy. In a market-based environment, they are as fundamental to good public policy as are the principals of transparency and open public discourse we complimented last month. As the SC Energy Freedom Act moves to the Senate floor for debate, SCCEBA will continue to share our support for this bill, and we encourage you to do the same. JOIN US ON MAY 22! Speaking of good public policy and diverse voices in open public discourse, SCCEBA is hosting our FIRST-EVER mid-year policy forum. Representatives from these companies are ALREADY registered – add your name to the list today! Building on the success of SCCEBA Member Meeting held before last year's SC Clean Energy Summit, SCCEBA is again holding a members-only meeting. The agenda will include an update on SCCEBA's continuing efforts to better define & deliver member value. The meeting will also offer members the UNIQUE & UNPRECEDENTED opportunity to help shape the agenda for the 2019 SC Clean Energy Summit, which is being re-branded as the 2019 SC Clean Energy Conference powered by SCCEBA. If you are already a SCCEBA member, plan to JOIN US for this meeting. If you are not yet a member, join today! Growing our state’s clean energy economy is the central focus of SCCEBA. Yet, market growth within a regulated environment is not dependent on capabilities and cost alone. Sound, market-based policy is needed. JOIN US for a review of the 2019 legislative session and discussion among South Carolina legislators and energy policy leaders about what comes next for SC clean energy policy. JOIN US for informal, Dutch-treat networking to close out the day. The SC Economic Developers Alliance (SCEDA) is our state’s collective economic development voice. SCEDA’s mission is to advocate economic development for benefit the citizens of South Carolina. SCCEBA’s mission is to grow the state’s clean energy economy. Earlier this year and for the FIRST TIME ever, SCCEBA joined SCEDA and is working to identify initiatives that would benefit the missions of both organizations and their members. Read more about SCCEBA’s engagement with SCEDA in this “voice of” letter from SCCEBA Executive Director Bonnie Loomis. Lockhart Power, a SCCEBA member and supporter since 2012, has been named 2018 Industry of the Year by the Union County Chamber! The award recognizes a company that had a powerful and positive impact on the community during the year. Lockhart Power’s 2018 impact, however, simply builds on a legacy of more than a century of service to its customers and to the community by contributing to its economic development, helping protect its environment, and supporting many of its civic and charitable organizations and its educational system. Last May, the General Assembly’s actions on the “solar bill” seemed like sheer chaos. We wondered, with others, if order would come before our state ran off the “cap cliff” for residential solar within the regulated utility system. Indeed, it appears that chaos has been “deciphered,” and the General Assembly is working to adopt order through a sensible, consensus-driven approach away from that cliff. The South Carolina Energy Freedom Act (H.3659) offers a solid, logical transition for solar beyond the provisions of Act 236 of 2014, and SCCEBA heartily applauds the extensive collaborative work that created the compromise version of this legislation. While the compromise bill is focused primarily on solar to the exclusion of other forms of distributed generation, SCCEBA understands this is merely reflective of current conditions in the South Carolina market and not an intentional effort to avoid broader clean energy policy development. And, we do not believe this factor should hinder passage of the legislation. Nevertheless, we caution the Legislature that the clean energy market is changing rapidly - more rapidly than laws can be made – and ask that they realize that their efforts to address energy policy need to continue in earnest and not wait until the next clean energy “cliff” is reached. To that end, SCCEBA respectfully suggests that the General Assembly include clean energy matters in their annual course of business, much as the budget and education are already. The clean energy market requires as much, and the state’s citizenry deserve as much. Beyond the solar aspects, the compromise version of H. 3659 includes provisions that are firmly grounded in the principals of transparency and open public discourse, and SCCEBA makes note of these with approval because they are hallmarks of good public policy. increases the level of scrutiny used in regulatory proceedings to approve new power generation proposals, including the allowance of a third-party evaluation if determined to be in the best interest of the public. Each of these provisions acknowledges the increasing role diverse voices and perspectives in the energy marketplace by affirmatively including such during Commission proceedings. Historically, state law has hampered such critical conversation, even if unintentionally. As the Senate continues its deliberations on H.3659, SCCEBA will be reaching out to lawmakers to offer this SCCEBA POLICY PERSPECTIVE. We encourage our members and supporters to do the same. JOIN US for a FULL DAY of CLEAN ENERGY! Drop by for informal, Dutch-treat networking to close out the day. Not yet a member? JOIN TODAY so you can also attend the SCCEBA Member Meeting earlier in the day and help shape the annual conference agenda! Thank you for your past and continued support of our South Carolina Clean Energy Business Alliance. Since our inception nearly decade ago, SCCEBA has advocated for policies and provided information to encourage clean energy innovation and economic development. We strive to be a collaborative organization that supports sustainable energy policies in harmony with our environment. 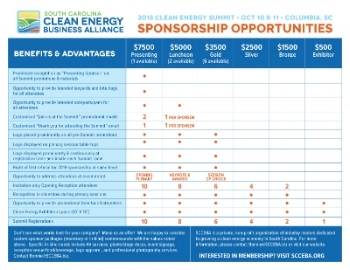 We are grateful for our diverse membership, and the past leaders who helped make SCCEBA’s annual Clean Energy Summit South Carolina’s signature energy forum and shaped our regional Business Roundtable events into valuable opportunities for information sharing. It is important for many voices from the diverse sectors of our economy - commercial and industrial; municipal, state, and federal; residential and non-profit - to engage together in developing policies that have broad support and are devoid of narrow interests. We are grateful for your participation in and being part of this collaboration to date. With the new year, Todd Delello ended his six-year term as SCCEBA Board Chair. Todd’s focus on establishing a business and economic development mission for SCCEBA sharpened our organization’s focus on SC clean energy policies rather than national initiatives. Under Todd’s long leadership tenure, SCCEBA also became entirely reliant on state-based membership support, rather than grants from national groups. The entire Board and I extend our gratitude and appreciation to Todd for his leadership. Through his contributions to SCCEBA, our organization is well-positioned to voice sensible state-level policies that create a market for innovative products and devices in a new age of energy. Grant Reeves, Senior Vice-President - The InterTech Group, will step up from Treasurer to become SCCEBA’s new Board Chair. He will be joined by Weston Adams, Partner - Nelson Mullins law firm, as Co-Chair. And, Robert (Bob) Long, retired SCE&G, will become our new Treasurer. Already, the 2019 legislative session brings a variety of bills that impact the commercial interests and jurisdiction of our members. How these proposed bills would change the framework of 2014’s Distributed Energy Resource Program Act affects everyone in our state. SCCEBA will listen to our members, draw on our collective firsthand experience and provide a forum for public discourse as these bills are debated. The new year also welcomes Dominion Energy to our state energy stakeholder conversations, just as efforts to move past the VC Summer project continue to weigh on Santee Cooper. As energy professionals and leaders, we will work together to achieve a positive outcome during these transitions. Your membership renewal and continued financial support of SCCEBA is crucial for us to continue. We greatly appreciate your ongoing commitment to our organization and to clean energy in South Carolina. CONGRATULATIONS! Three SCCEBA Member Companies make the SC Biz Fastest Growing Companies in South Carolina List! Southern Current has been named the fastest growing company in South Carolina for 2018 by SC Biz News and its Roaring Twenties awards. Headquartered in Charleston, SC, Southern Current operates in 10 states and is a market leader with nearly $450 million in investments for 500 MW to date. In the past year, Southern Current’s team has doubled in size to nearly 100 members. Twenty large companies and 20 small companies gathered at an event in Columbia to recognize the finalists at the Roaring Twenties presentation. This honor recognizes the state’s fastest-growing companies based on both dollar and percentage increases in revenue from 2016-2017. Hannah Solar Government Services (HSGS), a Service Disabled Veteran Owned (SDVOSB) solar energy company, headquartered in Charleston, SC, has just been recognized by SC Biz News as South Carolina’s 2nd fastest growing small business for 2018. This the second time that HSGS has been in the top fastest growing small businesses in South Carolina. In 2016, SC Biz News designated HSGS as the #1 Fastest Growing Small Business in South Carolina. Not only was Alder Energy named the 9th fastest growing company in South Carolina by SC Biz, but on August 23, Inc. magazine announced that Alder Energy Systems is No. 672 on its 37th annual Inc. 5000, the most prestigious ranking of the nation’s fastest-growing private companies. The list represents a unique look at the most successful companies within the American economy’s most dynamic segment—its independent small businesses. Border States Electric (BSE), a 100 percent employee-owned company, reached an agreement to purchase Shealy Electrical Wholesalers, an electrical wholesale supply leader in North and South Carolina. Shealy officially joined BSE August 1. This acquisition adds 350 employees in 17 branches. Shealy employees are now employee-owners and share in the financial success of Border States Electric, a 100 percent (employee stock ownership plan) ESOP-owned company. Shealy Electric Wholesalers / Border States has been a SCCEBA member since 2015 & Shealy SE Region Clean Energy Product Manager Jim Woods is a SCCEBA Board member. Burlingame, Calif. – July 12, 2018 – Today Proterra, the leading innovator in heavy-duty electric transportation, Alexander Dennis Inc (ADI) and Foothill Transit announced North America’s first electric double deck bus order for a public transit agency. ADI chose Proterra’s highly efficient E2 battery technology for its next-generation Enviro500 platform in North America, which will enter service in 2019 as part of Foothill Transit’s growing battery-electric bus fleet. The Alexander Dennis signature vehicle, recognized in cities around the world from London to Hong Kong, Auckland, Singapore, Toronto, Ottawa, Seattle and Mexico City, will utilize the same high-performance E2 battery technology from Proterra that broke the world record for range last year, achieving 1,101.2 miles on a single charge with the Catalyst® bus. This deal reflects the mass-market shift to electrification and the growth of zero-emission technology transfer enabling heavy-duty fleets to go 100 percent electric. Proterra became a new SCCEBA member in 2017 and a Summit Sponsor. SAN DIEGO and ATLANTIC CITY, N.J. (August 6, 2018) – EDF Renewables North America and Fishermen’s Energy, today announced the submission of a joint petition for approval of the Nautilus Offshore Wind project, located in state waters off the coast of Atlantic City. The project represents a crucial opportunity for New Jersey to gain the immediate benefit of local investment, jobs, infrastructure, and offshore experience ahead of many other states looking to capitalize on this new economy. EDF Renewables and Fishermen’s Energy will contribute to the New Jersey offshore industry and deploy capital investment to bring a first project online by 2020. EDF became a new SCCEBA member in 2017. Duke Energy Corporation (DUK - Free Report) announced that its unit Duke Energy Carolinas continues to support solar energy production for its customers. In excess of 5,000 of the company's South Carolina customers have already installed solar panels on their homes and businesses, reaching a legislative goal for customer-owned solar capacity. Courtesy of Duke Energy Carolinas’ support, and willingness and initiatives of customers, the company is expected to achieve its goal of 40 megawatts (MW) of private "rooftop" solar well ahead of 2020. Duke Energy Progress, the utility serving the northeastern part of the state, is well on its way to meet 13 MW of private solar goal. Duke Energy has been a SCCEBA member and Summit sponsor since 2014. Pacolet Milliken Eneterprises, Inc has been a SCCEBA member since 2015. The Town of Hampton received a Municipal Achievement Award for its Slum and Blight to Solar project. Officials accepted the award during the Municipal Association of South Carolina’s Annual Meeting on July 21. The town won in the 1,001 – 5,000 population category. Thirty cities and towns submitted their projects and initiatives. SCE&G / SCANA has been a SCCEBA member and Summit sponsor since 2013. The New York State Energy Research and Development Authority (NYSERDA) has announced the completion of what it claims to be the largest solar system installed in New York City. Located in Staten Island, the 3.1 MW solar array will offset a large portion of the electricity used by Fordham University and Fordham Preparatory School in the Bronx. ... The system was designed, developed and installed by New York City-based EnterSolar. Our board member, Brian Harvey, is a Business Development Director with EnterSolar. EnterSolar has been a SCCEBA member since 2017. Members of the former South Carolina Building Performance Association (SCBPA) have joined SCCEBA! We welcome our new members and allied partners and look forward to continuing the work of supporting and engaging clean energy industries across South Carolina and the southeast! This Energy Boot Camp is designed for those needing a quick and thorough understanding of all segments of the Carolinas' energy industry, such as new hires with backgrounds in other sectors or those who work in capacities like legal, finance, IT or communications who need operational context in order to best support operations. Attendees will come away with an understanding of our state energy mix, the producers and providers of that energy, and the market and policy issues they face ... PLUS, a handy glossary of industry terms and acronyms! of the E4Carolinas member rate, so register today! The Sustainable Fleet Technology Conference will showcase the latest and greatest technologies in the biofuels, electric, natural gas, and propane arenas. There will be a strong focus on data driven decisions and technologies. With more than 50 speakers and 40 exhibitors, the event will highlight the leading edge of sustainable fleet practices and alternative fuel opportunities. Secure your seat for SCCEBA's Clean Energy Summit! The clean energy industry is growing and in a constant state of flux. This year’s Summit will be THE place to learn more about what's in and what's out in SC's clean energy future. Secure your discounted seat today! Do you want your company in front of clean energy industry leaders, businesses, and innovators? If so, then don't miss this opportunity for your company's sponsorship of the 2018 Clean Energy Summit! All sponsorship levels receive a free 10' x 10' exhibit space! Over the last few years, SCCEBA’s leadership has refined the organization’s mission around clean energy economic development for our state, as opposed to grant-based research efforts. As a result, SCCEBA is now 100% MEMBER funded. This is a truly remarkable accomplishment for a clean-energy non-profit in a state that many don’t see as very forward-thinking when it comes to energy policy. Given SCCEBA’s sole reliance on member support, the SCCEBA Board and Executive Director Bonnie Loomis say THANK YOU to the following companies who joined or renewed their memberships between January and April of this year. More than 10 years ago, Google built their first data center in Oregon, and they’ve now built data centers across the US, including one here in South Carolina. These data centers provide the technological infrastructure necessary to power Google’s operations in the United States and contribute significantly to job growth and income gains at both national, state and local level. And, last month, Google announced that those data centers – and all their energy needs – are being fully met with clean energy. 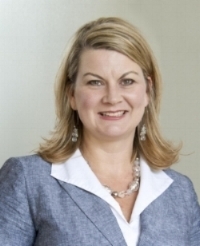 SCCEBA is privileged to have had support from Google since 2013, and Google’s Lilyn Hester, who heads Google’s external affairs in the Southeast, is a member of the SCCEBA Strategic Advisory Committee. Hannah Solar Government Services (HSGS) recently completed construction of a 1.2 megawatt (MW) ground mounted solar array for Otis Elevator Company at the company’s facility in Florence, South Carolina. The facility became operational in February and consists of 3,660 solar panels expected to generate 1,852,700 kilowatt-hours (kWh) of energy in year one, which is enough electricity to power 171 homes. The ground array is adjacent to Interstate 95, providing passersby with a unique view of Otis’ corporate commitment to power their operations with clean, renewable energy. HSGS has supported SCCEBA as both a member and Summit sponsor since 2014. Alder Energy Systems LLC, recently completed five solar installations on municipal buildings for the City of Beaufort in conjunction with Johnson Controls. Combined, these installations include 876 panels producing 365.5 MWh of solar energy annually. Alder Energy Systems has been a SCCEBA Affiliate member since 2016. Are you a SCCEBA Member? Do you have news to share? A South Carolina native with undergraduate and law degrees from the University of South Carolina, Loomis is a proven leader with nearly 30 years of experience working in and around South Carolina state government and business. She completed energy and leadership programs at both The Thunderbird School of Global Management at Arizona State University (energy) and the Kenan-Flagler Business School at the University of North Carolina-Chapel Hill (leadership), as well as the Riley Institute at Furman University’s Diversity Leaders Initiative and Leadership South Carolina. From 2013 to 2015, Loomis served as a member of the SCCEBA Board.